Bay of Plenty is one of New Zealand’s top holiday destinations, being one of the sunniest region on the North Island, the Bay of Plenty is a great year round destination. Mount Maunganui has been voted the best beach in New Zealand again and again and the view from the top of the Mount is one of the top Instagram shots in New Zealand! 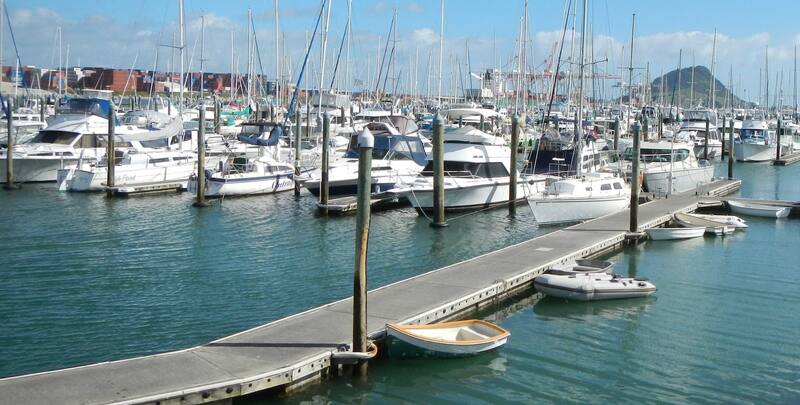 Whether you’re after adventure, beach lifestyle, fantastic nightlife on the waterfront the Bay of Plenty has it all! Have we already mentioned how awesome our location is!? Well this location became even more awesome in April 2017 when the tidal stairs and pier were built on The Strand, right on our front door step! This is an EPIC place in summer to show off your bombs or you can just cool down with your feet in the water enjoying the view while soaking up the sun and great atmosphere. It's also a great place for many small events where you will be treated with live music and food trucks. Just around the corner you will find the Tauranga Art Gallery which hosts exhibitions and events that change their displays made by national and international artists on a regular basis. It's free of charge but a small donation will be much appreciated. 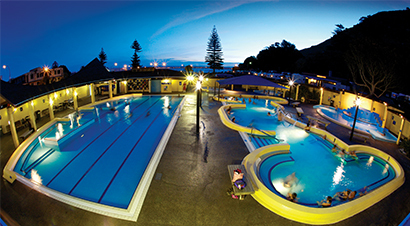 At the base of Mount Maunganui you will find the salt water hot pools. This facility has been a long favorite of locals and tourists. Not is it only very relaxing, the benefits of the warmed salty water has its ability to rebalance and detoxify our bodies. The warm salt water will help to improve mobility by easing muscle and joint inflammation and general aches and pains. What better to relax the muscles after a hike up the Mount! You even have a great view of the majestic Mauao from the pools. Not far from the hostel you will find a fantastic Ocean beach! Catch the local Bay Bus from the Information Center around the cornor or drive 10 minutes to the best beach in New Zealand! Mount Maunganui beach has golden sand with crashing waves on one side of the harbour, or go over to Pilot Bay for the gentle shores and shade. It is a great place to practice your surfing skills, work on your tan, play some beach volley or to relax and eat some fish and chips with sunset. If you're an early bird you really can be the only one on the beach! Summer time is a different story though and can be very busy as this is where most of New Zealanders like to holiday! The Strand is the place to be when it comes to the Tauranga night life. As you walk out our front door you will find yourself amongst all the restaurants, pubs and bars. There is always a place where you can enjoy live music, a pub quiz or any type of food you'll be craving for! From Asian fusion to pizza nights and the best fish and chips in the Bay of Plenty at Bobby's fresh fish market! The Farmers Market is held every Saturday from 7.45am – 12pm at the Tauranga Primary school on 5th Ave, off Cameron Road. Rain or shine! A diverse range of locals present some of the finest seasonal fresh produce, breads, pastries, cheese, smoked fish, oils, relishes, juices, plants, honey, flowers & other delicious edibles from the region! Shop local and support locals! There is always some form of musical entertainment too. You'll find many beautiful waterfalls and springs just outside of town. On an average of 20 to 30 min drive from the hostel, you will find Kaitati waterfalls, McClaren falls and park, Omawana waterfalls and the Blue springs. Each and everyone of them unique in their own way. From crystal clear water to hidden gems in the forest. Waikareao Estuary Is a 9km loop track, Waikareao means “sparkling waters of the new day” it is ideal for walking and cycling and a short walk from the hostel. Mauao - Mount Maunganui, means “caught by dawn” and is a historic reserve and owned by Maori. Tramp to the top or walk around the base track, this is the most short walk in the country! There are several tracks to the summit. The summit is 232m high – it takes about 40 minutes to get to the top, depending on the amount of pictures you take along the way! The water tank half way up on the western side has a huge Maori mural on it which is well worth a photo too. The base track is 3.4m and takes about 45 minutes to walk. The views for both walks are absolutely amazing and breathtaking! You just need to catch a local bus over to the Mount from around the corner from the hostel. Or if you prefer to head over to Mount Maunganui - stay at our sister hostel Pacific Coast Lodge and Backpackers, it is a short stroll to the beach and there is also lots of nightlife! For more information on any activities within Tauranga please go to Tauranga's official web site. Or if you are wanting more information for the whole of New Zealand go to 100% PureNZ .